Singer-songwriter, storyteller and master instrumentalist McCutcheon celebrates folk legend Pete Seeger’s 100th birthday with a blockbuster album of Seeger songs! 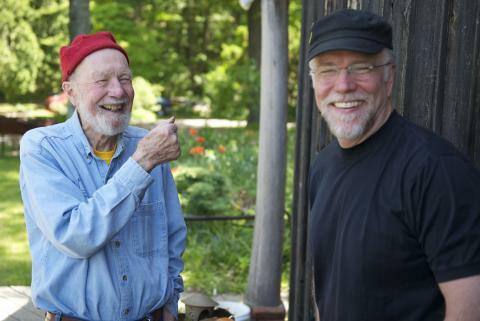 Pete Seeger introduced America to itself, one song at a time. Whether it was "Erie Canal" or "If I Had a Hammer," he told us who we are and helped us imagine who we might become. John McCutcheon’s stunning new collection celebrates Pete's centennial birthday (May 2019) with a recording of some songs that moved him the most during his long years as Seeger student, admirer, colleague and friend. From “Sailing Down My Golden River” to “Turn, Turn, Turn,” to “Waist Deep in the Big Muddy” it’s a big and loving tribute to an amazing man, musician, American. Himself one of America's most respected and loved folksingers, McCutcheon is master of a dozen different traditional instruments, most uniquely the rare and beautiful hammer dulcimer. Hailed by critics and singers around the globe, his 30 recordings have garnered every imaginable honor, including seven Grammy nominations.